This high quality, heavy weight professional butchers sausage twine is made of a strong poly/cotton, #24 gauge fiber, perfect for a variety of kitchen tasks. Use it to tie back and truss chicken and turkey legs when roasting, which helps the meat to cook evenly and stay in place, tie bundles of herbs, hang meat to dry, tie up roasts, or keep pork, beef, fish and other meats fresh with butcher paper. The small ball easily fits the tight spaces of a kitchen but still offers 390 feet of strong butchers twine! This twine comes in handy when I am cooking my rotisserie chickens. I will say that it does appear to pick up things around it very easily so I must store them in bags in order to prevent the twine being stained. This is decent twine and reasonably plentiful. I have had no issues with expansion or contraction. It unwinds a bit too easily and I have found I have issues when cutting it often. It does the job perfectly and always fast shipping! It looks small but it will last forever. Of course the best price you can get. This is a great item of great quality. I love this product and will continue you use it on a day to day basis. Awesome! This twine is easy to work with and sturdy. It has a great price so I use it in several ways such as for pork or beef roasts, herb bouquets or a quick, reusable tie in the kitchen. It’s string. Not much to say about it except it is considerably less expensive than at the grocery store and it is definitely more sturdy. No more breaking the string when I tie a knot too tight. This butcher twine is versatile and can be used for food or for hanging signs up around the restaurant. It was much stronger than expected. Works just as you’d expect and sure can’t beat the price. We use this for tying bags and is much less expensive than ribbon. We will order this again in the future. Great quality. This twine was used in a 4H cooking camp setting. The kids used the twine to tie a bouquet of herbs together. Would order this in the future! This is a great value. Twine sold elsewhere is sold by the foot, so you get a similar sized ball that's hollow in the middle. This is much longer than that, has virtually no stretch to it and works perfectly. This was a very good buy. The twine does not smell or reak of any odor and I feel safe using it with my meat products. I also use it for tea and coffee to tie up bags also. Item is very useful in some many ways. To tie meats and use to freeze items.l , It is also great to tie up herb bundles for stewsl, stocks,soups any type of meat or vegetable dish. Convenient. I would highly recommend this product. Great twine. We use this to tie sandwich paper with. It's strong and easy to tie. The twine itself feels thick and like it won't break apart. I bought this to use for gift wrapping. it did not disappoint! its basic butcher twine, but its exactly what i was looking for. it is definitely strong enough for my application and for the price you get a ton! I will continue to buy from here! Very Strong and plenty of it! We use it to make Salami. Has not let us down. Suggest you wear gloves to get a really tight knot. The 1/2 pound butcher ball of twine is a great buy. The twine is great for tying up t-shirts and small bundles of fire sticks. This is good for tying up chicken feet and doesn't smell of chemical. The thread is strong so does not untangle and be fuzzy. Great price as well. This one half pound ball of gauge butcher sausage twine is a winner. It is easy to cut and works well. I like how easy this twine is to order and will continue to do so. The fast shipping and quantity discounts are a huge plus. This is a great tool to have in any kitchen. You can use it for bouquet garners like I do in my kitchen. works well. This is the best type of butcher's twine you can find any where. I use it every time I roast, and for other food tasks. Great value on this butchers twine. Always good to have a few rolls in the kitchen and for this price I had to grab a few. I like this twine a lot. We use it to tie up roasts. It unravels easily, but I haven't been able to find any twine that doesn't. This is great twine. It holds up well in heat and ties tight and true. The ball is a nice size to manage but still contains plenty of threads. This is good quality butcher twine. I use it to truss up my chickens before I bake them in my dutch oven. The thread holds up well and is easy to remove. This is a very nice twine.. it is a good weight and we like that it is a smaller spool.. It works fine for in our kitchen. bought for home use, surprised it was hard to find in SC, good deal here online though! For trussing birds it works great and a practical item for other non cooking uses. This butcher string works for so many uses. I use it secure flat boxes for shipment. It also works great as a gift wrapping string. I used this when I was making chashu for ramen. Basically tightened it around some rolled pork belly and braised it for a few hours. It held up well. Great twine. Gauge Butcher Sausage Twine is an excellent product that can be use in various cooking methods. I've used them to tie a cheese cloths filled with herbs when making stock. They also work with keeping meats wrapped together for either keeping the meat more juicy or the stuffings within itself. I always seem to find a better deal at webstaurant store. These cost more at my local grocery store, and its not even clear of what the content is. These seem to be safer choice for food. Great quality stuff, can use it for just about everything, I use it when tying roast and other types of meat. Very sturdy and holds up well. I bought this for uses other than food and it is the best out there! Very strong and works very well with everything that I have used it with! Will be buying again! This twine is sturdy. It is useful wrapping cardboard, hanging wet towels. One spool lasts months and we go through lots of bundles of cardboard. This twine is definitely of a higher quality than some other twine out there. I previously ordered a (brand-name, smaller, four times more expensive) ball of twine from Amazon and was dissatisfied because the product reeked of chemicals. Luckily, this twine from Webstaurant Store has no detectable odor and is strong enough for every application for which I've used it. Going to have to buy the two pound spool next time. What else could you need? It's the perfect twine for trussing, shaping, and/or securing your meats. Great for creating herb bundles or just tying up pastry boxes! Get a ton of it -- you'll find uses for everything. This seems like a good quality string / twine. It's exactly as expected and a good value in my opinion. Don't use it often but it's nice having it when needed. This coton string is both strong and of natal fibers. Our church youth group of 160 had a reenactment experience and this string fit right in. This is a great price for an extremely versatile kitchen accessory. I use this twine primarily for trussing chickens, but I also use it to tie roasts, secure bouquet garnis and even for tying in gift tags in a pinch. I definitely recommend keeping this in your kitchen. This butcher sausage twine is good stuff. Hardy and doesn't break easy also easy to handle. One of the better twines out there. We recommend this product. I purchased the #24 gauge butcher sausage twine in the 1/2 lb. ball. The cotton twine is finished well and holds firm when you use it on your food. Durable and yet very compact. It is the size of a softball to start. Very high quality and knots tie very nicely with this twine. 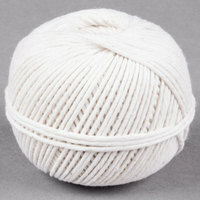 This is a nice, heavy gauge twine at a great price from Webstaurant! We use it not only for roasts and such but for a lot of other things that need to be tied. Great value, will buy again! Nice butcher twine. I ordered 3 rolls so we wouldn't run out anytime soon and am very happy. This is strong twine and works great on roasts or turkey legs. Very good price. Nice, heavy gauge sausage twine that holds up well under heat and can be used in all sorts of applications. Will buy again for sure. This twine is very thick and doesn't shed pieces into food. Unfortunately, the many strands untwist very easily. For tying tea bag strings together, I just licked my finger and re-twisted. For a bouquet garni in chicken stock, I 'glued' the fraying ends with a smear of butter. 24 Gauge Butcher Sausage Twine 1/2 lb. Ball is a good quality. I had used it for my stuff chicken breast. I will buy again if needed. This is a great product at a good price. I not only use it to truss my chickens and tie roasts but also to tie up my tomato plants to a wood stake to hold them upright. Great use for turkey, pork, and other cooking uses. The price at a cooking store is easily triple what webstaurant charges. Plenty of twine comes in this roll. This is a versatile product. I use it for for food products like sausages, tying up a roast, and even for wrapping presents with. It is a good quality as well as a good price. Easy to use and holds tight when wrapping pork loins, roasts and sausage. Definitely something I'll keep using over an over again. Personally the smaller size ball makes it easier to feed around the meat vs. the larger size. Very high quality twine. Great for roasting whole chickens, pork tenderloins and more. It is very thick and holds up to high temperatures in the oven. This butcher twine is great for tying up roasts and whole poultry. It's very strong and does the job well. With the WebstaurantStore's low price, this item is a no brainer. For some reason this stuff is hard to find in stores, at least where I live. This is great to have on hand when making roulades or roasted chicken. I even like it to make a rustic bow on gifts, especially food gifts. 1 ball, infinite uses. Great for roasts, creating bouquet garnis, but also other non-food uses like candle-making. This is a perfect size for my large homemade candles. I absolutely love this butcher twine. I use it all the time in the kitchen and you can't beat the price. It works great for tieing herbs together for a pot of soup or for tieing a roast. Handy for lots of things. Of course for tying meat up before roasting. But such a lovely rustic white color that I use it for packaging treats and gifts especially with brown kraft paper items. This stuff is great to have in the professional kitchen. extremely useful for trussing chickens and any other kinds of meats or roasts. great for pork loins. This butcher twine is thicker and stronger than what I get from the local butcher. It is 12 strand and holds up perfectly even in a 425 degree hot oven. I wish I would have bought another ball or two!